I think it’s about time to show you an example of a real case we did using Guided Implants.This gentleman came to us looking for help to improve his smile. He had many options for treatment, but the route that best suited him was to remove all of his teeth and place dentures. At Arizona Periodontal Group, our main focus is saving teeth. However, there are some cases in which the gum disease has progressed to a point that the patient would actually lose money trying to save his or her teeth with dental procedures. Due to the amount of Periodontal Disease, or bone loss, our patient was going to need a little bit more stability for the prosthesis on the lower. Our plan was to place four implants on the mandible (lower jaw) that would anchor this fixed set of teeth. 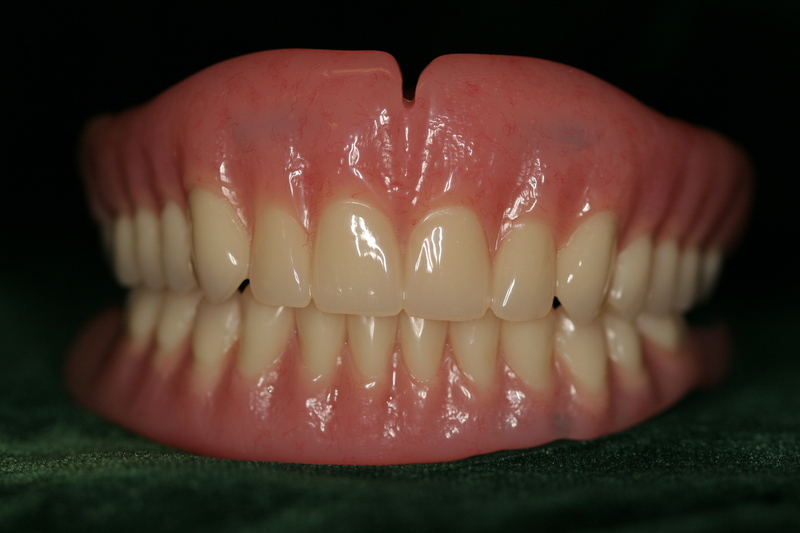 We planned on placing a standard denture on the top arch because it offered more stability in his case. Step one involves gathering as much information as possible. We take lots of photographs, models, CT scans (such as the Gallileos), and even pick out a shade for the teeth. All of this information is sent to the lab. We were happy to work with Van Hook Dental Studio on this case. Step two requires a lot of lab work. At Van Hook Dental Studio, they spend time studying these models, photos, scans, etc., to plan accurate placement of the four implants in order to provide complete retention for the fixed set of teeth. 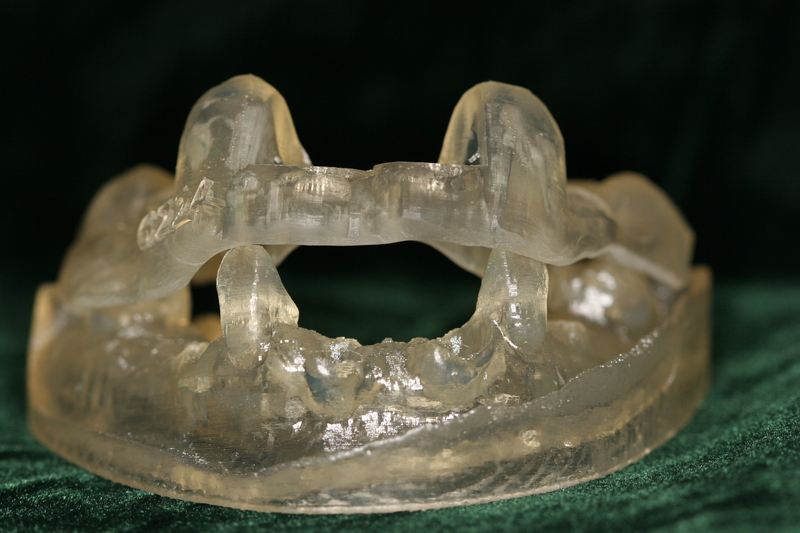 They also have to make sure the top denture will fit once it is delivered. 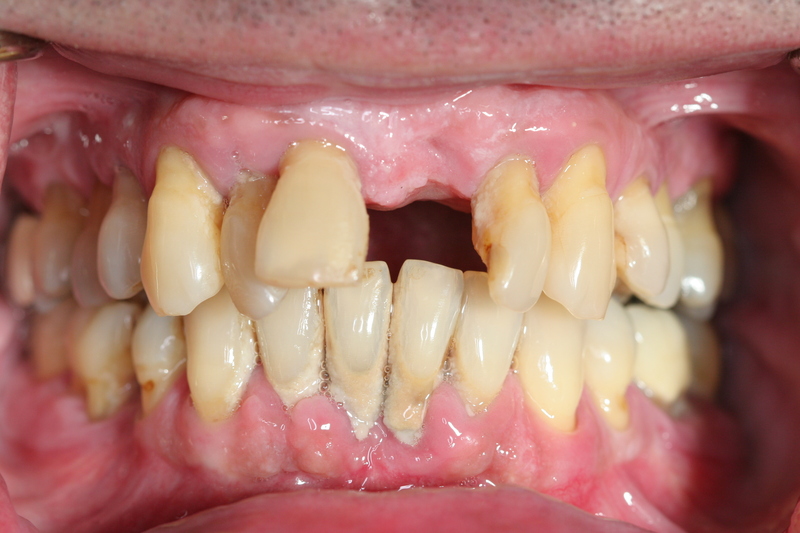 In this patient’s case, our main goal was to make sure he left our office that day with a set of teeth. Step two ends with the completion of the surgical guide for placing the implants. As you can tell, it is important to be as meticulous as possible because there is no margin for error when it comes to treating our patients. Step three takes us back to our office, but the lab work isn’t over yet. Once the lab sends all of the guides, models, the top denture, the bottom set of teeth, and the prescription for the sizes of implants needed, we can finally schedule the patient to have his procedure done. 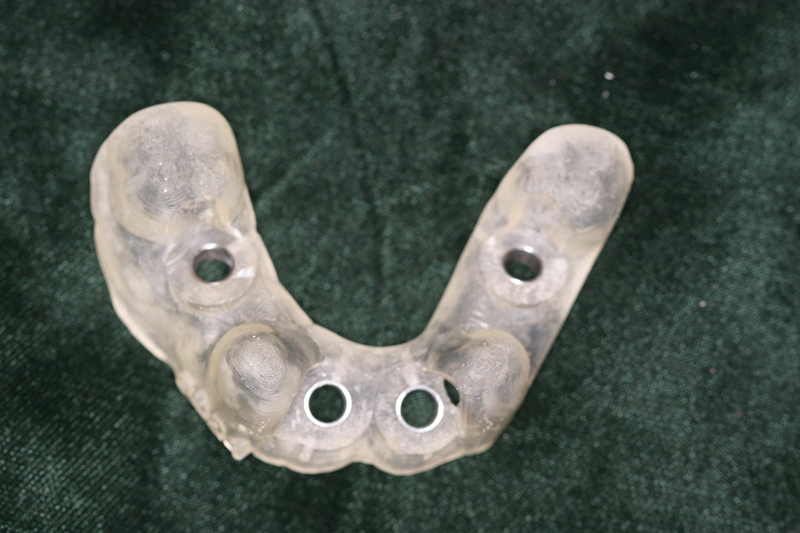 The following pictures show the guide for this patient, a front view displaying how it fits over his teeth, as well as the denture and fixed prosthesis that will be delivered to the patient before he leaves that day. Step four is showtime! Once our patient was sedated, Dr. Trujillo worked with an oral surgeon to remove the patient’s teeth and prepared the mouth for the implants. The lab was also there for when the denture and fixed prosthesis were ready to be seated in case any specific adjustments needed to be made. Not all guided implant cases are like this one. Many of them only involve one or two teeth, and don’t need to go as far as removing all teeth. Again, this was the most conservative route for this patient in the long run. 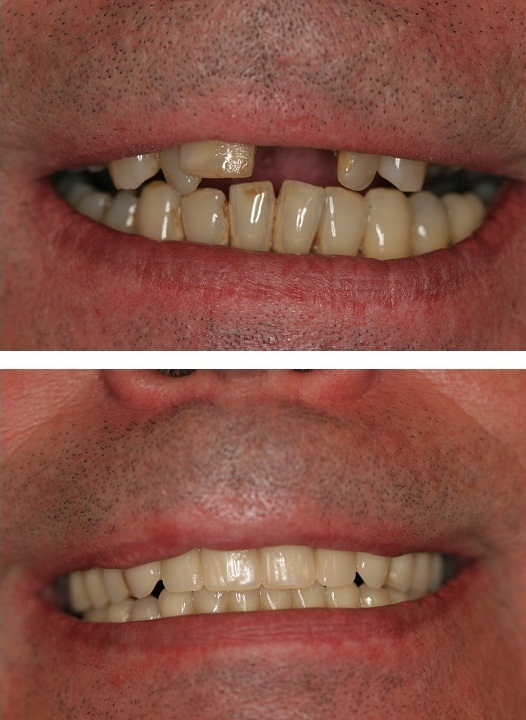 The end result is so rewarding, and the patient got his teeth just in time for Thanksgiving! We have a lot of other cases coming up at our office in Phoenix, Arizona. Stay tuned for more before and after photos!